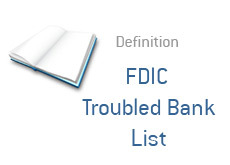 FDIC Troubled Bank List - What Does It Mean? What is the "FDIC Troubled Bank List"? What is the purpose of formulating this list? The FDIC troubled bank list is a list of US banks and thrifts that are deemed, by regulators, to be at risk of failing. Q. How does the FDIC determine whether or not a bank will be included on the list? A. Every 12-18 months, examiners will scrutinize the overall well-being of each and every bank or thrift in the United States. They will examine every aspect of the bank, including their risk management policies, delinquent loans and cash reserves. These examiners will then give the bank a grade of between 1-5. 1 is the best possible rating, while 5 is the worst. If a bank receives either a 4 or 5, then they will automatically appear on the "troubled bank" list. Q. What happens when a bank appears on the "troubled bank list"? A. Banks that appear on the troubled bank list are told by regulators what they must do in order to solidify their overall financial standing. If they can't do these things, then they run the risk of being shut down by the FDIC. Q. How many banks are currently on the "troubled bank" list? A. 416 (as of August 28th, 2009). Q. How can I find out whether or not my bank is on this list? A. You can't - the FDIC doesn't release this information to the public. A. Because they fear that it would cause bank runs that would quickly lead to the demise of many banks and thrifts throughout the nation. Q. Don't I have a right to know this information? A. You would think so. Q. Does a bank appearing on the "troubled bank list" necessarily mean that they will eventually fail? A. Not at all. I would be surprised if 25% of the banks that are currently on the "troubled bank list" failed over the next 12 months. Inclusion on the "troubled bank list", while definitely not a good thing, usually provides a wake-up call for a bank or thrift to change things for the better, and quickly.